The MOSSAR Color Guard Teams participated in a Flag Raising at the Lone Jack, Missouri Elementary School in Lone Jack, MO on Friday, May 15, 2009. 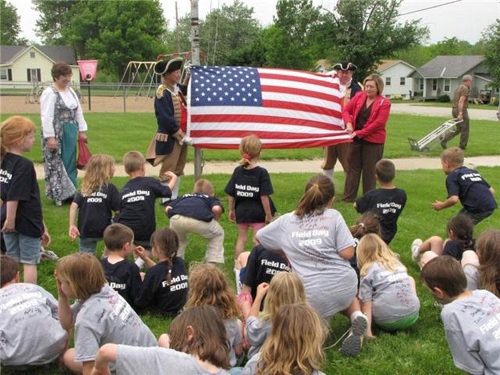 The Independence Pioneers DAR Chapter coordinated to have the flag flown originally over the United States Capital Building and then subsequently donated the flag to the Lone Jack, Missouri Elementary School. In addition, the Independence Examiner on May 20, 2009 published this news story on page A-7. All three Independence Pioneers DAR Chapter members, including Regent Linda Sehart, provided information about the U.S. Flag. Christy Waller, who is shown in the right photo, made the arrangements, as her daughter attends Lone Jack, Missouri Elementary School. Left Photo(L-R): Carolyn Grover, Independence Pioneers DAR Chapter; Major General Robert L. Grover, MOSSAR Color Guard Commander; Captain James L. Scott; and Regent Independence Pioneers Chapter Linda Sehart. 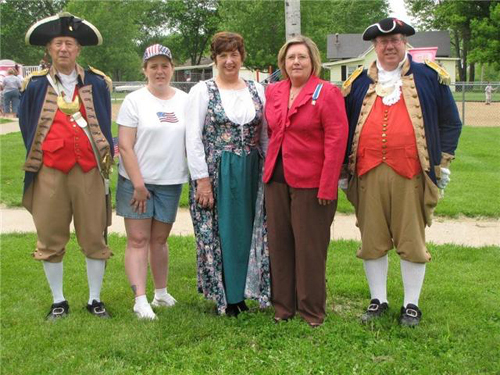 Right Photo(L-R): Major General Robert L. Grover, MOSSAR Color Guard Commander; Christy Waller, Independence Pioneers DAR Chapter; Carolyn Grover, Independence Pioneers DAR Chapter; Linda Sehar, Regent Independence Pioneers Chapter and Captain James L. Scott.